Join us in Nashville Tennessee on Saturday February 9th at 9am for a FUNdraising Good Times workshop hosted by The Tennessee Tribune. This is an opportunity for local nonprofits to learn more about fundraising, and to work directly with us, Mel and Pearl Shaw. We will answer your questions and share what we have learned about the Prerequisites for Fundraising Success. Cost: $30 per person. Tables are available. limited to 30 people. Email to reserve tickets or tables. We look forward to seeing you on February 9th! Here are three upcoming workshops in the SF Bay Area that will help you raise money to better your community. Get out your pen and paper — or your iphone — and note the following dates so you can take advantage of these low-cost, high-quality lea rning and networking opportunities! 1. Apply now! If you need to know how to raise money from individuals for your non-profit then you need to sign up for the Fundraising Academy for Communities of Color. This seven month training program is focused on helping nonprofits based in communities of color in Alameda, Contra Costa and Solano Counties. The deadline to apply is Friday, August 20th.The Academy is offered by CompassPoint and the Grassroots Institute for Fundraising Training (GIFT) and begins in October. The Fundraising Academy helps nonprofits led by people of color that are primarily supported by foundation grants or government funds. Learn how to build a base of supporters from the communities you serve and advocate for. Learn how to shift your approach to fundraising, strengthen your skills, and increase your goals and results. Click here for more information or call (510) 452-4520 x301 and ask to talk with Manish. You can also visit www.grassrootsfundraising.org to find more great information to help grow your fundraising. Tell them Mel and Pearl sent you! 2. 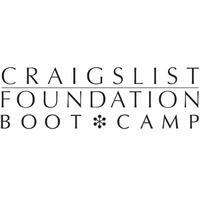 Craigslist Foundation Boot Camp. Saturday August 14, 2010 on the UC Berkeley Campus. This one-day boot camp is for people who are concerned about their communities and neighborhoods. The focus of Craigslist Foundation Boot Camp is simple: to connect, motivate and inspire greater community impact. This year’s boot camp has a new community-building focus that will bring together emerging and experienced leaders in the social and nonprofit sectors, aspiring and accomplished social entrepreneurs, professionals and decision makers from government, business and the community building sectors. If you want to learn from and network with people who want to enrich and empower their local communities and neighborhoods then this is the conference for you. To learn more visit www.craigslistfoundation.org or call (415) 278-0404. If you are a student or your organization has a budget of less than $500,000 the cost is just $99. 3. Fifth Annual Nonprofit Management Institute. October 5th – 6th on the Stanford University Campus. Hosted by the Stanford Social Innovation Review and the Association of Fundraising Professionals. This institute will help you figure out how to lead your organization during these challenging times of structural change. The recession has permanently changed the approaches organizations need to take to raise funds; nonprofits have to work with government in new ways; traditional governance models are shifting; and social media has turned communication upside down. This year’s institute will address these important strategic topics and emphasize the new leadership skills needed for managing and growing nonprofit organizations during times of dramatic change. Click here for more information visit or call 703-519-8494. Don’t be left out! You need to know what it takes to stay afloat and grow. And as always, remember to have a FUNdraising Good Time! Where can you go to learn everything you need to know about fundraising? Is there a one-stop-shop for information about fundraising that can help fundraising professionals, board members, volunteers, consultants, and executive directors? Is there a place to learn how to improve your direct mail campaign? How to write better proposals? What about the right use of technology? Well, Fundraising Day 2010 has all the answers you are looking for. Mark your calendar for June 16, 2010, 8:00 am to 5:00 pm and show up at the Marriott Hotel at 55 4th Street in San Francisco. Fundraising Day is a one-day nonprofit fundraising training for the Northern California nonprofit community. Organizations of all sizes and types are invited. With 40 workshops scheduled, there is something for everyone. One thousand people are expected to attend with an average of 100 attendees per workshop. And don’t worry – food is provided. There will be a continental breakfast, two coffee breaks, and lunch, with vegetarian options available. The Science of Direct Mail: How Does It Measure Up? How to Approach a Foundation: From Initial Contact to Getting Funded — What Does it Take? The event is presented by the Association of Fundraising Professionals, Golden Gate Chapter and the Development Executives Roundtable. Both of these organizations offer workshops and programming throughout the year to support the work of non-profit organizations across the Bay Area. They come together to present this conference to help strengthen the many organizations providing vital services, strong advocacy, and inspiring arts productions. The conference also includes an Ask the Experts Pavilion where you can sign up to talk one-on-one with an experienced professional about a specific fundraising question. The Career Café provides an opportunity for people who work in the nonprofit sector to talk with a coach or other individual for guidance on how to build their career or find a new job. To learn more, or to register visit www.afp-ggc.org/frd2010 or call (415) 404-6501. We know: you never had time to wrap your head around “Web 2.0” and now you’re hearing Web 2.0 is over! Seminars and interns are telling you all sorts of frightening/enticing things about what you can do on the internet: Money flows in rivers online! Prospects flock like geese online! Data can be panned like gold at online! E-blast! Blogging! Twitter! Run! Catch up! Arrrggghhh! Yes, the online landscape changes fast, but you don’t have to keep up with everything: you only need a basic map. In this presentation we’ll draw a map of the kinds of fundraising and communications tools that are available for nonprofits online, and how they connect with each other. We’ll look at your needs and how these tools integrate into an overall strategy. We’ll also look at specific services and providers so you can go straight back to the office and start trying stuff out. Presenter: Claire Light is a Bay Area writer and cultural worker. She has worked for eleven years in nonprofit administration, particularly arts in the Asian American community. Most recently, she’s been consulting in online communications and fundraising for nonprofits in the Bay Area. Previously she worked as development coordinator for Women’s Initiative for Self Employment, co-founded and served as a senior editor and development director at Hyphen magazine, and was program manager at Kearny Street Workshop. She currently blogs for Hyphen magazine. Cost for Luncheon: DER = $12, non-members = $20. Lunch is included in your fee. Learn about grantwriting from a former program officer! Take advantage of this new NONPROFIT FUNDRAISING WORKSHOP SERIES. Here’s your chance to learn in a small group, interactive setting about what makes a proposal stand out. Learn how to frame your story, and how to get to know foundation staff given the cultural and power dynamics impacting relationship building. Learn from Learn from Darlene Hall a former program officer of color with 6 years experience in philanthropy at family and community foundation. Community-based workshop locations in San Francisco and Oakland, California. • Limited space! Sign up today! Darlene brings 20 years experience in the nonprofit and philanthropic sectors that crosses several fields including mental health, teaching/training, youth development, social justice and social services, and sports/athletics. Have you been asked to raise money for a non-profit, college, hospital or church? Are you willing but not sure how to proceed? Is it your job to prepare volunteers and staff to solicit gifts? If so, How to Solicit a Gift was written for you! We wrote How to Solicit a Gift: Turning Prospects into Donors for two reasons. To help people learn how to ask others for a gift to an organization or institution they believe in. And to help the staff of non-profits, colleges, churches and hospitals understand how to best prepare volunteers to solicit gifts. Fundraising is much more than simply asking people for money. 90% of fundraising is preparation. Only 10% is actual solicitation. Learn what it’s all about and how you can succeed. Join us at Fundraising Day 2009 in San Francisco on Monday May 4th! Fundraising Day 2009 is the West Coast’s premier full-day training conference designed for today’s development staff, executive directors, board members, volunteers, and consultants—from newcomer to seasoned pro. Fundraising Day 2009 offers ideas, tools and opportunities to refresh your skills and ignite your enthusiasm. If you are charged with raising money for your organization this is the conference for you! Everything you need to know under one roof. Meet your peers. Meet experts in the field. Learn best practices. Consider attending if you are a volunteer or a staff member. Get answers to your questions and find a way to help your organization. Sign up now for the Bay Area Blacks in Philanthropy seminar. The focus is capacity building. The seminar is free. Registration is required. More information at BABIP website or (415) 946-3025.